Los Angeles County is large coastal county in southern California, dominated by the City of Los Angeles which, at 3.8 million people, is the second largest city in America. Los Angeles County is much larger than the city limits of L.A. The county has over 4000 sq mi that stretch from coastal lagoons to coniferous forests in the San Gabriel Mountains, from offshore islands to high desert scrub in the Antelope Valley. There are vagrant traps galore, including the offshore islands of Santa Catalina and San Clemente [see a separate Channel Islands page]. Indeed, Los Angeles County vies with San Diego and Monterey counties for the highest county list [San Diego leads at this writing by just a couple species], and a county Big Day team reached 215 species. Los Angeles County was once even larger than it is today. It was an original county when California became a State in 1850 but it became about 8 times larger in 1852 when its territory expanded to included almost all of today's Kern & San Bernardino counties. This spread was substantially chopped back with the creation of San Bernardino (1853) and Kern (1866), and then Orange County was born from its southern arm in 1889. Randy Newman wrote a song entitled I Love L.A. Personally, I feel just about the opposite. Between the smog and the traffic and the Dodgers, I hate L.A. But that really speaks to the city — Los Angeles County is quite a different thing. I've seen some lovely locales and some amazing birds in the county, from Trumpeter Swan to Hudsonian Godwit to Bohemian Waxwing. Haven't taken very many photos there, though. 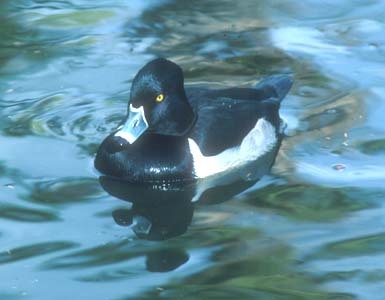 I did take this nice portrait of a male Ring-necked Duck in Arcadia (below left; 27 Dec 1983). 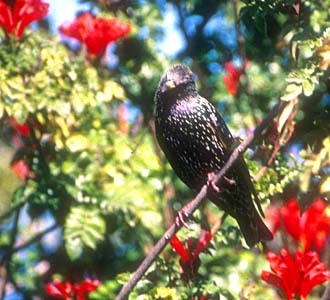 But since L.A. is home to flocks of escaped parrots, and was the world center for 'Ringed Turtle-Dove," I can't resist putting in a Starling as my other shot (below right; 26 Nov 1999 at Malibu). 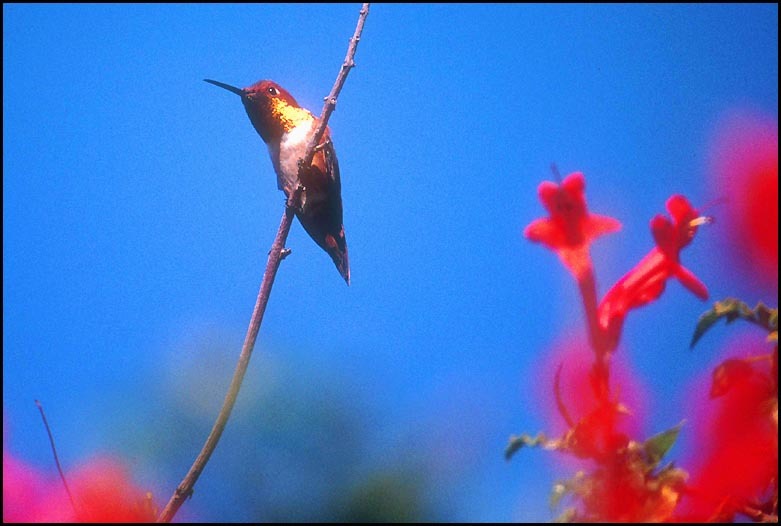 The headline photo of male Allen's Hummingbird (above) was also in the little park adjacent to Malibu Lagoon. Given the late November date, the Allen's is presumably of the subspecies sedentarius.